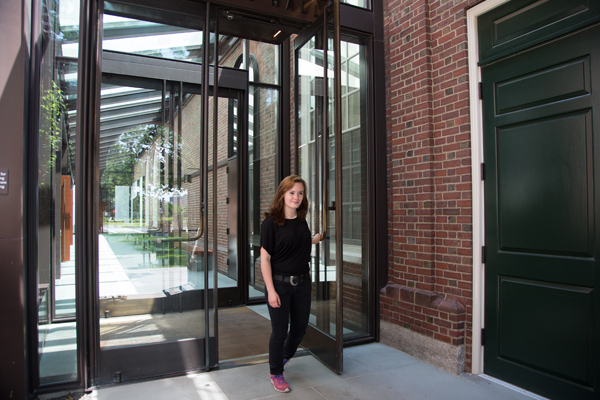 Three noteworthy buildings on the campus of Harvard University recently underwent renovations that included the installation of custom balanced doors by Ellison Bronze. William James Hall, named after the famed American philosopher and psychologist, was designed by renowned architect Minoru Yamasaki in the 1960s. Yamasaki's other works include the original World Trade Center towers in New York City. The hall is home to several of Harvard's academic departments – Psychology, Sociology and Social Anthropology – and the university's Building Resources office. Another building improvement project is McKinlock Hall, an old neo-Georgian residential section of Leverett House built in 1925 and used by undergraduate students. Existing space inside McKinlock was reconfigured to reduce crowding in both common areas and private rooms, improve the flow of traffic throughout the building and, in general, modernize the look and feel of the building's interior. Harvard's Legal Services Center was founded in 1979 to provide improved legal services for the urban poor and provide clinical education for attorneys and law students. Today, it assists more than 1,000 clients each year with civil legal problems. In 1992, a $2,000,000 donation allowed the law school to purchase and renovate a permanent location for the Center, which now features Ellison doors. These projects are just three of many taking place at the university. In November 2015, Harvard reached an impressive milestone, achieving its 100th Leadership in Energy and Environmental Design (LEED) certified building. According to the U.S. Green Building Council (USGBC), Harvard has more LEED certified building projects than any other college or university in the world. In this spirit of excellence, outfitting such buildings with Ellison Bronze custom balance doors seems only natural. Based in Falconer, NY, and the inventor of the balanced door, Ellison creates door systems that achieve the highest standards for aesthetics and functionality. The main entrance to the 10th floor of William James Hall features Ellison balanced doors made from extruded aluminum. The Ellison doors in McKinlock Hall are made from formed-up bronze. The doors in the Legal Services Center are made from extruded aluminum. Unlike conventional entry doors, Ellison aluminum doors, such as those in William James Hall, are constructed from heavy wall extrusions that are made solely for Ellison and specifically designed to work in conjunction with their balanced hardware. The door horizontal top and bottom rails are attached to the vertical stiles using both welded and bolted connections, yielding an extremely durable and long-lasting entrance. 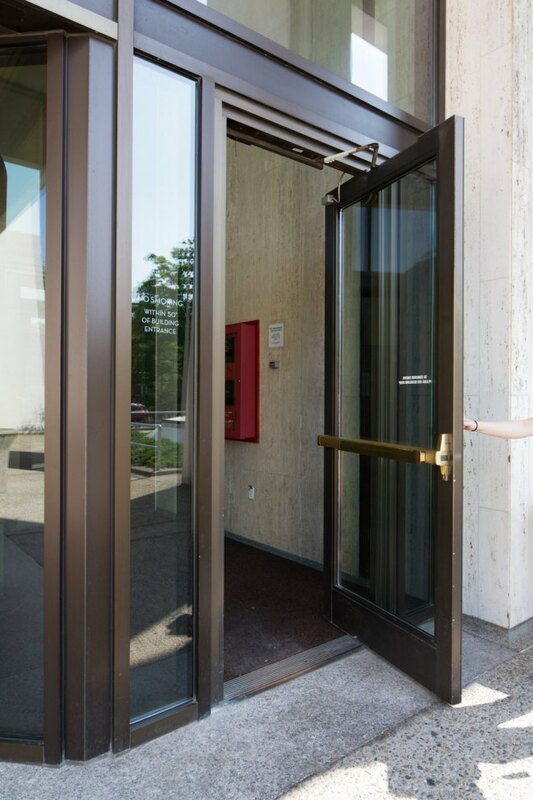 Whether made from bronze, extruded aluminum, or formed stainless steel, Ellison balanced doors consist of sturdy components that can be opened with ease. A balanced door features an inset pivot point at two-thirds the width of the door, creating a balance that distributes the weight so the door requires little force to open. The inset balancing point allows for an easier open force, even against external wind and internal building pressure. Ellison doors can easily be made to comply with ADA requirements and can be fitted with built-in overhead concealed power operation, if desired. Ellison provides detailed record keeping and full warranties – important when considering the extensive lifespan of an Ellison door. Every door made is imprinted with an individual project number (similar to that of a car's VIN number) to facilitate easy tracking and maintenance. Furthermore, all Ellison balanced hardware components are machined in-house, which means that replacement components are always readily available. "It is an honor to know that our doors are being used every day on Harvard's campus," says Mark Graves, President of Ellison Bronze. "They lend themselves to buildings with great demands not only on classic, high-quality aesthetics, but modern performance as well. 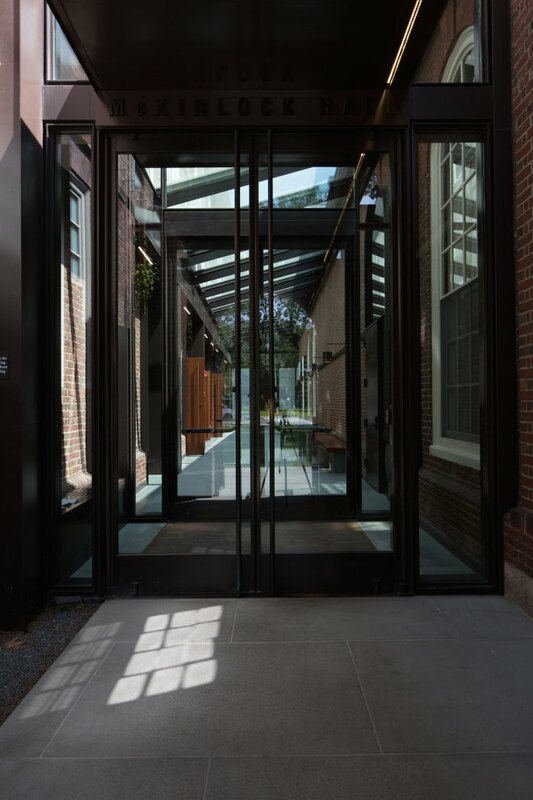 As the oldest institution of higher learning in the country, Harvard is the perfect place to showcase Ellison Bronze, the oldest balanced door manufacturer." The architect for the William James Hall project was Robert Olson + Associates, based in Boston; and Kieran Timberlake of Philadelphia was the architect for the McKinlock Hall project.